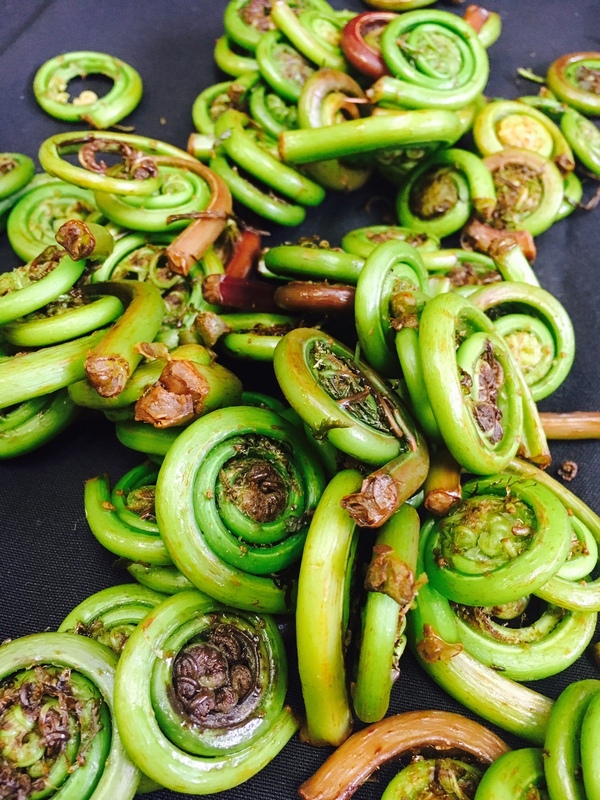 We have an extra special something for you next week: Forage, celebrating the sprouting, fruiting, blossoming, coiled-up, hiding treasures of spring, with smoked quail and huckleberry sauce, wheat berry & morel risotto, fiddlehead ferns & fava beans, bay nut meringues, and more. See, we were not kidding about the extra special. The basics: We’ll deliver it to Berkeley, Oakland, and San Francisco, on Thursday between 5:00 and 8:00 pm. We offer a small size, feeding 2-4, and a regular size, feeding 4-6. The regular all-in can feed up to 8. The crate is suitable for one big dinner party, a weekend getaway, or several everyday meals. We’ll include our usual leaflet with serving suggestions, reheating instructions, recipes, and a shopping list for getting creative. The vegetarian version contains the risotto, the omnivore’s version contains the quail, and the all-in contains both. Orders are open until next Tuesday at 3:00 pm, or until they sell out. To enjoy warm or cold with a deep, rich sauce of wild huckleberries. A simple, elegant risotto of Full Belly Farms’ Frasinetto wheat berries, to show off the morel mushrooms tucked into it. We are just standing on the roof shouting “SPRING” around here. Nasturtiums, borage, begonias—sharp, spicy, and cucumber flavors, plus butter: tasty and pretty. The ultimate foraged salad. Look for this growing along your hiking paths this spring and summer, especially where the ground is wet. We love its earthy, succulent character. A little anchoring sweetness, a foil for all the bright unfurling hallelujahs. Foraged in the fall, these nuts are dark and taste similar to cocoa nibs, which makes them perfect for studding sweet and crispy meringues. Extras this week include Morell’s sunflower bread, our own turkey stock, and Nuthouse granola. You can always request an extra of any element on the menu, or a custom version if we are making something you cannot enjoy. Have a wonderful weekend—we’ll see you Thursday! We have a new spring menu for you, as gangly and full of promise as a wet baby swan: chicken in a salt crust, a spring roots and shoots soup with matzo balls, cardoon salad with fava greens, nasturtium leaf pistou, duck eggs, and more. As usual, we’ll deliver it to Berkeley, Oakland, and San Francisco, on Thursday between 5:00 and 7:30 pm. We offer a small size, feeding 2-3, and a regular size, feeding 4-6. The crate is suitable for one big dinner party, or several everyday meals. We’ll include our usual leaflet with serving suggestions, reheating instructions, recipes, and a shopping list for getting creative. The vegetarian version contains the soup, the omnivore’s version contains the chicken, and the all-in contains both. A lumpy golden parcel of crust acts as seasoning and oven for the pastured chicken within, resulting in a beautifully moist and tasty bird, not to mention an impressive presentation: the perfect thing emerging from the wreckage of its shell. We’re a little early for Passover, so we’re giving this in straight-sided jars in case you’d like to freeze it for next week. It’ll be rich with spring treasures and fluffy matzo balls; you can keep it vegetarian or add some of the chicken to it. A pile of Swiss chard with a little cream, Gruyere, and Vella’s Mezzo Secco. Hearty and irresistible. For your soup, for your chicken; for elevating and brightening everything it touches. Cardoon is the ultimate ugly duckling: thorny and gawky and requiring lots of attention, but beautiful in the end, tasting a little like artichokes and looking like celery. We’ll do the hard part for you, and pair it with celery, fennel, fava greens and a sweet-tart dressing. 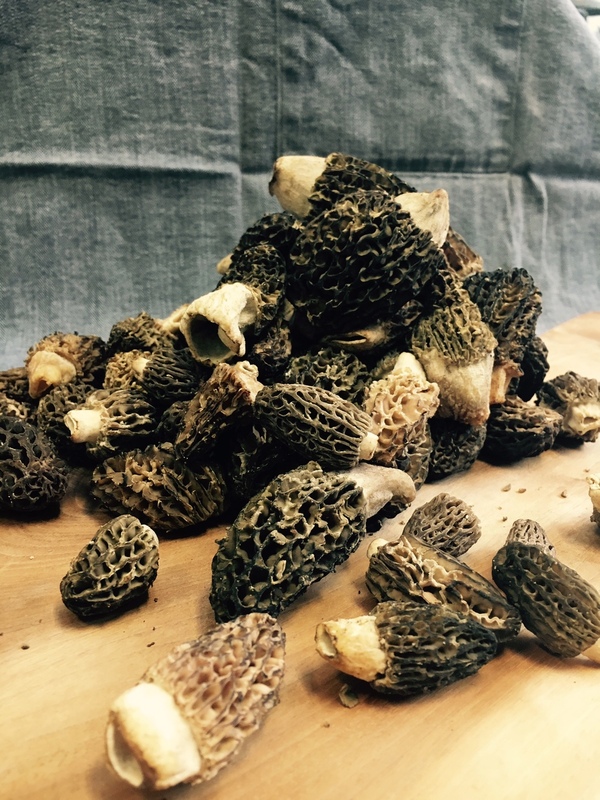 Rich and silky, wonderful for custards (we’ll give a recipe), for poaching in your soup, or scrambling. Plus, we’re suckers for a metaphor. Our homemade strawberry jam in a flaky butter crust, because we like you. Extras this week include Morell’s Full Belly Wheat, Nuthouse Granola, and our own stellar chicken bone broth and strawberry jam. Thanks for supporting sustainable farmers and handmade food! We’ll see you Thursday.